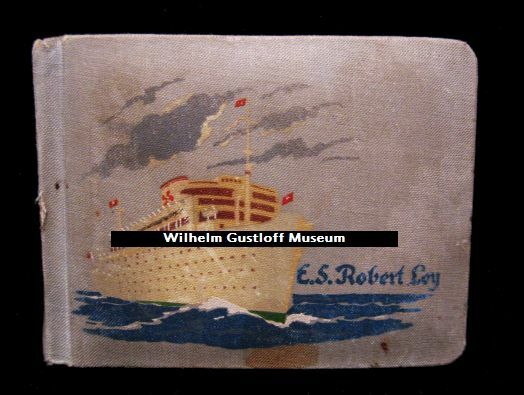 Despite cruising for only 6 months, it seems like a significant number of photographs and postcards exist from the Robert Ley to tell her story. 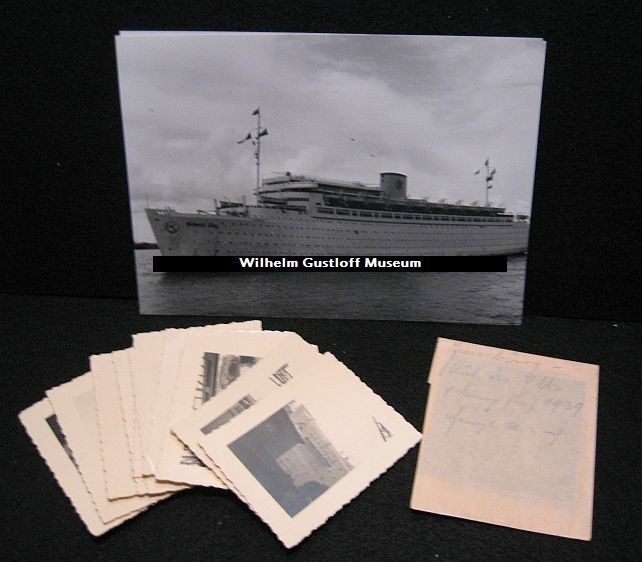 I have been fortunate enough to obtain not just individual items, but entire groupings from a collection on her maiden voyage, to a collection on her last trip as a cruise liner. Our current Robert Ley photo collection consists of 12 albums and 750 images. 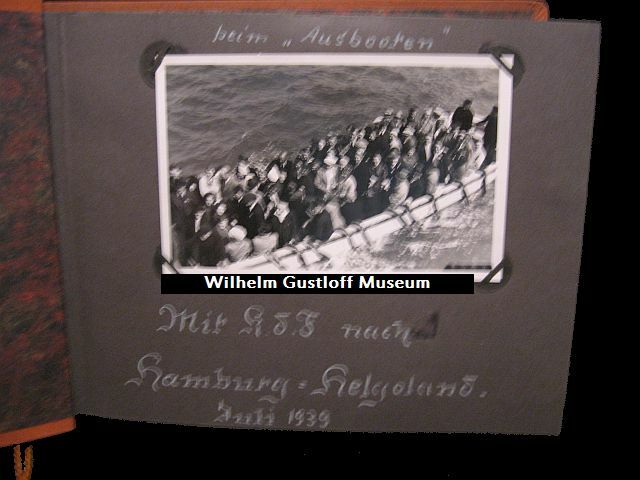 These photos came with the maiden voyage speisekarten collection on the previous page. There are also two maiden voyage postcards in the lower postcard section. 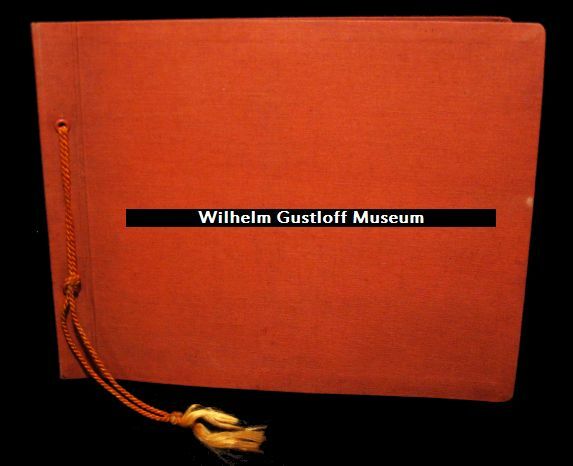 Her set of 12 Souvenir Photographs are included in the first small photo album below. Photos = 128. 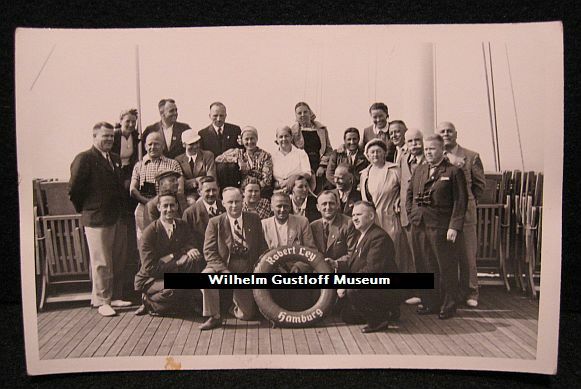 The scenes are of Hamburg at the piers and include several liners, as well as personal photos and family photographs in the end (not listed). 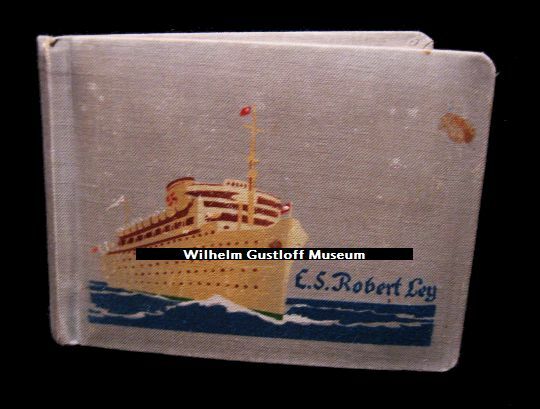 The first 16 photos are the official souvenir photos sold on board the Robert Ley. There are two interesting aspects of this photo album. 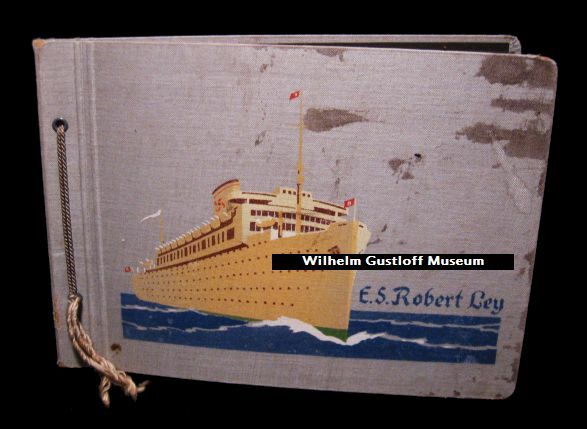 This is the photo album with the staircase photo of the painting of the Wilhelm Gustloff rescuing the crew of the Pegaway. *See Pegaway Rescue. 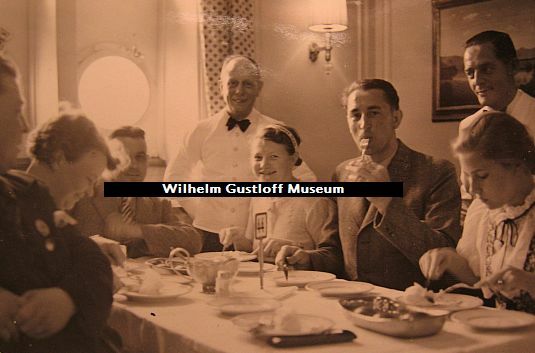 Going back to the Hans Hasse collection, this album has a photo of passengers dining on board. 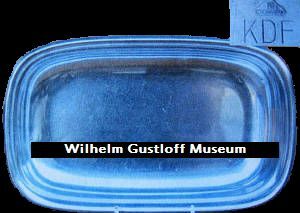 Right of that is an image of the silver bread tray from his collection that was sold, and this same style of silver is clearly shown in the dining room photo. A passenger snapped these and had them turned into postcards - not mailed. Liner negative and reproduced photo from it dated 1939. Voyage Photos: 40 Photos Total - 26 shown. 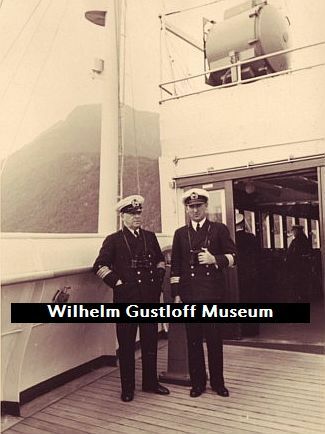 Receptions of the Norway trip with ship "Robert Ley" of the 9.-15. August 1939. 3. In the multitude zone with Norwegian water airplane. 4, 9: In the Karmsund. 5. Promenade cover 100 km. 7. 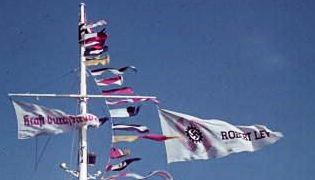 The 3 bow flags: KdF Norway Robert Ley. 13. Fish flour factory in Haugesund. 16. Of the table 27 on the boat cover. 17. 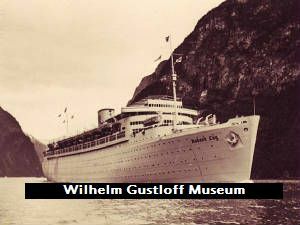 Passing with the "Wilhelm Gustloff"
room boat and fish steamer. 21. On the home trip early 7 o'clock. Photos may not be in order from side list. 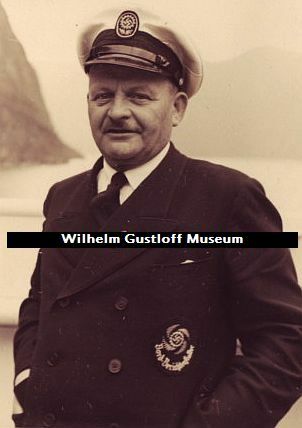 "The Captain of the new 'Kraft durch Freude' holiday ship 'Robert Ley'"
The National-Socialist Fellowship "Kraft durch Freude" has arranged with the Hamburg-America Line to act as shipping agency for the new "Kraft durch Freude" ship Robert Ley, which will begin its service in the near future. 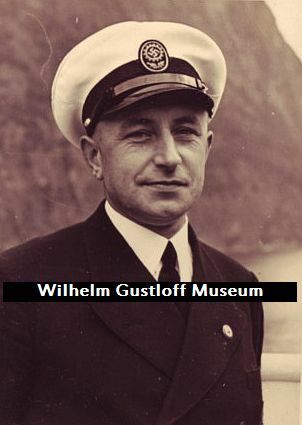 Captain Heinrich Falkenbach will be in charge of the ship. 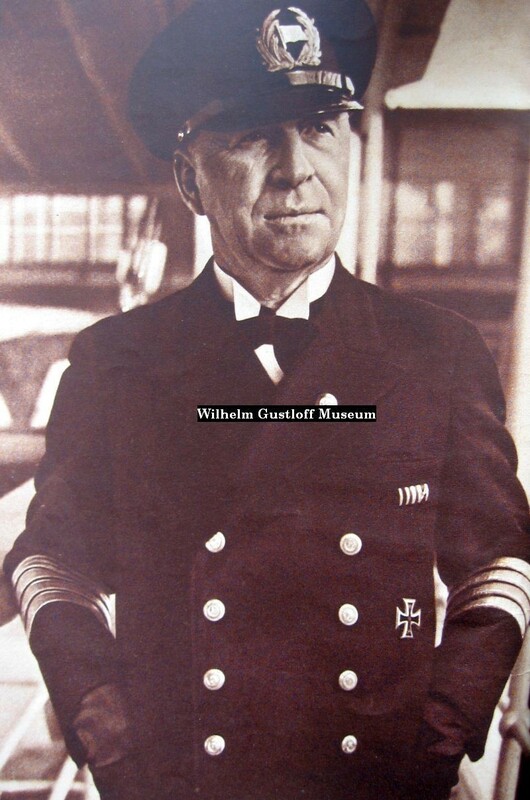 Our picture shows Captain Falkenbach, who was born in Coblenz on 22nd July, 1881.